As a safety precaution, make sure to turn off circuit breaker or fuse for the heater before doing any troubleshooting. Checking the power will also tell you if a power issue is the problem. Look for tripped circuit breakers that need to be reset or blown fuses that need to be replaced. If there’s no hot water, ruling out a power problem is the first step, Whirlpool says. After looking for tripped circuit breakers or blown fuses, check to make sure there’s power running to the thermostat for the electric water heating element. If it’s receiving power and it’s still not working, replace it or the heating element. If the water’s not running hot enough, make sure the heater is large enough by checking if it can manage 75 percent of its capacity as hot water. After checking this, look for a crossed connection. You can do this by turning off the water source and then turning on the hot faucet. If water still runs, there’s a crossed connection. Next, check the upper and lower heating elements to make sure there’s power and electrical continuity. Replace the element if needed, clearing way sediment before you install the new element. If the element is working, check the upper thermostat and then check the lower one to see if either needs to be replaced. If the water is running too hot, the thermostat is usually set too hot. Verify that both upper and lower thermostats are set in a range between 110 and 140 degrees Fahrenheit. 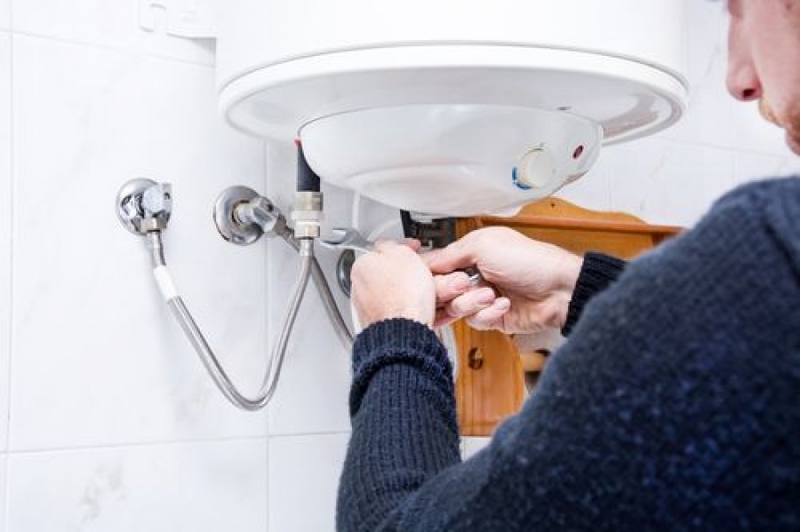 If there’s a leak problem, after turning the power and water off, the first thing to check is whether the temperature and pressure (T&P) relief valve is working. Determine this by placing a bucket under the pipe overhead, turning the valve to open and flushing any debris. If the leak continues, repair or replace the valve. Next, lower the thermostat setting to make sure there is no excessive heat or pressure. After this, look for any loose pipe connections that need to be tightened. Follow up by checking the heating element bolts and making sure they’re tight. If the heating element still leaks after all this, take it out and replace the gasket. Finally, check to make sure the storage tank isn’t leaking. Corrosion or other issues such as worn o-rings can cause storage tanks to leak. Keep extra o-rings at home so you don’t have to make an extra trip to the store if you need a new replacement. Rust-colored water can be a sign of a corroded glass-lined tank or a sacrificial anode rod that’s going bad. A bad rod should be removed in favor of a magnesium anode replacement. A smell like rotten eggs can be another symptom of a sacrificial anode rod that’s on its last legs. To fix this, start by flushing the water heater. Then use a solution composed of 2 pints of 3-percent hydrogen peroxide per 40 gallons of water to treat the tank for two hours. If this fails to remove the smell, use a zinc-alloy anode to replace the old anode. If all this doesn’t remove the smell, remove the heater and replace it with a plastic-lined substitute. A low noise with a rumbling quality can be a symptom of sediment buildup causing overheating and making water boil. Flush the water heater to fix this. A whining noise with a high pitch can be a symptom of scale build-up on electrical heating elements. To fix this, flush out the water heater and clean up any scales that have accumulated on the tank and elements. Then replace the heating elements with low-watt density substitutes with greater surface area for improved heat transfer.